This slow sinking small crumble results in fast early stage growth. Excellent for fry to juvenile stages. Satisfies the high fat and high protein requirements of all early stages regardless of adult feeding strategies. 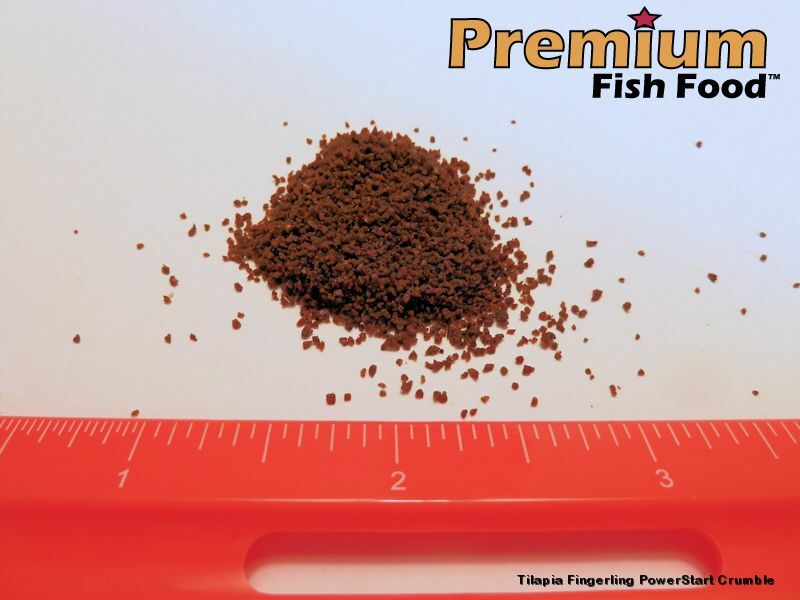 PowerStart Fingerling Crumble is high in easily digestible proteins and fats, very important for optimal tilapia growth at this stage in life. Tilapia will quickly grow to 2 1/2 inches on this diet. Slow sinking to deliver food to fish at all levels of the water column, very important in higher density stocking situations. Tilapia growers choose PowerStart crumble over other fry and fingerling foods available because it delivers excellent, perfectly balanced nutrition without negatively impacting water quality and clarity. PowerStart crumble is also commonly used when growing tilapia and catfish juveniles in a polyculture system since juvenile catfish have the same nutrition requirements as the tilapia at this stage of life. Typically begin feeding to fry/fingerlings at 3-4 weeks old. Continue feeding crumble until Tilapia reach 2 1/2 inches.